Last year’s Word of Intention was “Trust,” and it was appropriate. Yet, for me, 2016 proved to be a year of eye-opening education. I sought and gained a multitude of knowledge applicable to various areas of my life. Such information allowed me to expand my mind… to think… to plan… to strategize… to make choices… And that was all well and good, and appropriate. But as the year came to a close, I felt critical of myself. You see, in all my learning and thinking, I fell short on some of my personal aspirations for the year. Hence, my goal for 2017: less thinking, more doing. 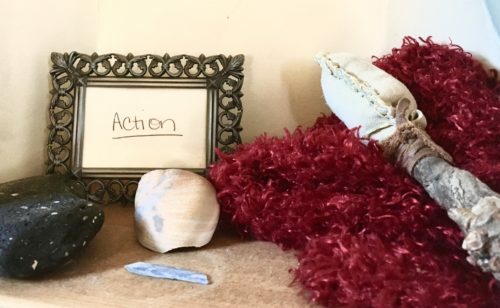 This year’s Word of Intention is “Action.” It’s a term I chose with purpose and determination. 🚴‍♀️ I take action to improve my physical wellbeing (as my triceps can already attest). 😘 I take action to increase and enhance the relationships in my life (both personal and professional). 🐶 I take action to support my favorite causes/charities (through a commitment of time and money). 🎁 I take action to expand my coaching services (stay tuned for details). 🇺🇸 I take action towards a more cooperative divide in the country (I haven’t quite figured this one out yet). So far, I’m encouraged by the impact my word has had on my everyday life. I know the year is young, but so far I’ve found it a little easier to get out of bed in the morning. I’ve also felt more productive throughout the day, and I’ve been eating more vegetables. I should probably journal my progress so I have something to refer to when I feel discouraged. What about you? Have you chosen a Word of Intention for this year? Posted in Uncategorized and tagged 2017, action, education, word of intention.